Take a step back from work or study for a moment and imagine you are at this Ellie Goulding concert. Now imagine a world where the crowd don’t provide instant feedback. They listen casually and then 6 or 12 months later write a review and rate the performance. What kind of performance would Ellie give without immediate feedback? What level of energy, enthusiasm and engagement would everyone else feel without that immediate feedback? This provides a great place to begin our exploration of Agile Performance Management. We can’t make the workplace like an Ellie Goulding concert, but we can build on the energy of our time and create enthusiasm and engagement. To start with, we’re going to take a trip back in the Delorean Time Machine. Searching for a place to start? We’ve got just the whitepaper for you. 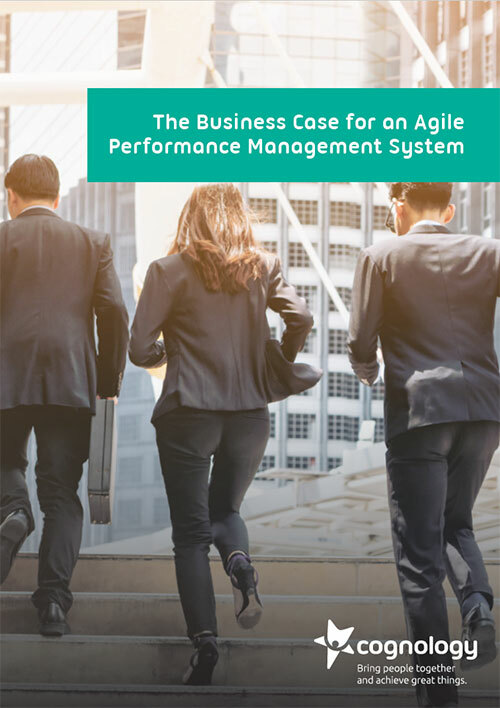 Download our complimentary whitepaper, The Business Case for an Agile Performance System, and get started today. Performance management practices have progressively improved since their beginnings in the 1950s as a management method. Even so, in the 1980s they still largely sucked. But something happened in the 1990s. The workplace started a radical shift in earnest that was driven by technology. All of a sudden managers typed their own letters instead of sending them to a typist. Scores of spreadsheet warriors started to automate anything and everything. Stand alone PCs were connected into office networks. While the workplace was changing, performance management was developing. Sophisticated tools were being created such as competency based assessment which has since transformed over 20 years into capability frameworks. But even with all these improvements, aspects of performance management are still either ineffective or incredibly badly done. Feedback and appraisals are two examples. Agile Performance Management is the successor to Performance Management. It is designed for the new world of work which is more collaborative, social and faster moving. In a time when communication is instant, the once a year appraisal just doesn’t cut it. In an ever changing and fast paced workplace, no feedback makes no sense. Agile Performance Management plugs the holes that exist in performance management. It takes what doesn’t work well with performance management, fixes it and then supercharges it. A more skilled and capable workforce can perform at a higher level. Just like on an elite sporting team, regular feedback, communication and coaching is needed to create high levels of performance. It’s critical to realise that these two important features are part of a wider group of improvements in Agile Performance Management. Let’s take a look at what they are. In Agile Performance Management, we want to reduce the feedback gap as much as possible. In the Ellie Goulding concert that we started with, the feedback is immediate. As a result the shared enthusiasm and energy builds. Adjusting and negative feedback also needs to be timely, but in private. See our article on giving feedback to learn how it’s done. One of the things you’ll learn is that the absence of feedback can contribute to work-related stress. Would it be possible for the coach of an elite sporting team to set goals for players then not talk about them further for an entire playing season? Of course it wouldn’t. It’s easy to see just how ridiculous that would be. But that is precisely what happens in the large number of businesses that still conduct one or twice a year appraisals. For leaders, goals are an important tool because they enable you to give team members autonomy side by side with responsibility. They provide a clear direction for the team member to follow. Not only that, they align people to the big picture strategy of the organisation. Once set, if the leader is serious about the goals, it makes sense to check-in with team members to regularly discuss and adjust course. See our article on how to conduct check-ins (one-on-ones) with team members. Crowdsourcing is a great tool for mining the collective intelligence and experience of others. In it’s simplest form, it is a process of asking a group of people questions to elicit feedback. You can crowdsource feedback for yourself or others. Crowdsourcing is a particularly useful tool for leaders who don’t work closely with all of their team members on a day to day basis. The reason for this is simple. As a leader you are responsible for coaching and developing your team members. But imagine one of your team has been working remotely on a project for two months. How can you talk about what’s going well and what they need to improve when you haven’t seen the person at all. The answer is to crowdsource feedback from key project team members. Here’s an article on the author’s experience crowdsourcing for feedback. And two others on the difference between 360 degree feedback and crowdsourcing (part 1 and part 2). Recognition coming not just from managers, but from a person’s other work connections. Picture yourself working on a team. You’ve been working hard on a new initiative. In an online enterprise social system, one of your colleagues writes a post that others can see recognising your achievements. How encouraged would that make you feel? Most people would be spurred on to keep making similar efforts. Skills matter more than hierarchical power in the new workplace. Having access to talented people with the right skills can make or break a business. As a result Agile Performance Management puts a greater emphasis on skills and capability development. Check out our article explaining skills in more detail. New approaches such as eLearning, coaching and mentoring are quicker and can be less costly and more effective. Particularly when a person can put learning into action as soon as possible after a development activity. Coaching is quickly becoming a highly valued skill for leaders to possess. To get ahead of the game, see our article on coaching. Twice a year appraisal conversations. Emphasis on development and forward looking performance. Goals can change if business priorities shift. More use of coaching and just-in-time learning. 9. Why is Agile Performance Management important? The numbers for Agile Performance Management are impressive. Let’s take a look at two examples. In recent research1, Deloitte have concluded that companies who manage goals quarterly generate 30% higher returns from that process than companies who manage them annually. In research2 conducted by Deloitte for Google Australia, they found that companies who prioritise collaboration are twice as likely to outgrow competitors. What is the outcome the business is seeking by implementing Agile Performance Management? Deciding which components of Agile Performance Management to implement. How will you train leaders and team members? Who are the stakeholders at different levels of the organisation? How can they be involved in the implementation process? Explaining why the process is being implemented. What needs to be done and by who. Critically, leaders need to be trained how to give feedback, write quality goals and conduct regular check-ins. A post implementation review is needed to iron out any issues with the new process. With such important benefits you can’t afford to get left behind with outdated practices. If the process you are using looks like something that belonged in the 1980s, it’s time to change. The new world of work is not only more collaborative and faster moving, it’s also more fun and fulfilling. Looking for a place to start? 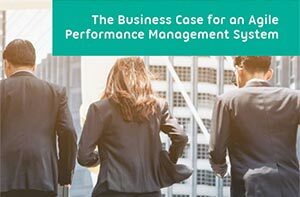 Download our complimentary whitepaper, ‘The Business Case for an Agile Performance Management System‘.